At last, a new work! ...It was high time I worked with my pastels again; as a teenage artist I was known for my pastels but for some reason I've just drifted away from them. Today, pastels are back. This work was completed just this morning. Total time to complete: About 2 hours. I've painted this subject before, but it is a beautiful area and I wanted to revisit it. Now, I did this using my plen air drawing board and paper (Canson 9x12 recycled). Had I used a paper with more tooth, I could have added additional values but the paper was saturated so this is what we have. As it has been a while since I worked in pastels, it felt a little awkward at first. But I got comfy fairly quickly. I could be wrong but I think it's a keeper. UPDATE: I used this painting as a reference for a slightly larger version. That painting was entered in the local county fair art competition. It won FIRST PLACE for landscape on paper and BEST IN CLASS (All works on paper). 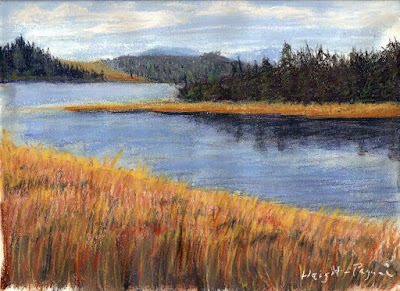 I'm reading: Nestucca River Oregon Pastel PaintingTweet this!